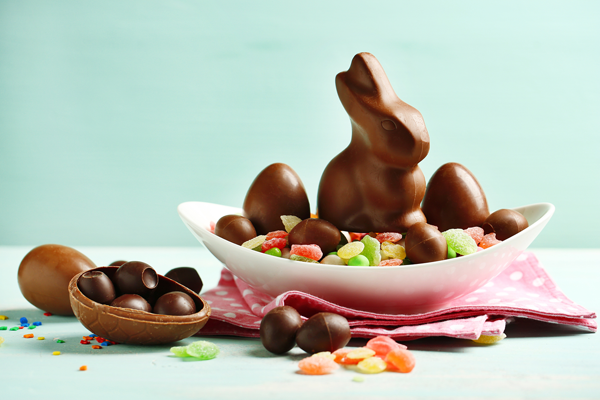 Since Easter is rapidly approaching, you’re most likely thinking about all of the delicious treats and candy left in your basket. However, if you’re participating in orthodontic treatment, then you might want to check again before you bite into a handful of jellybeans or a Snickers bar. Because your braces are adhered to your teeth with dental cement, it’s very easy to accidentally break a bracket off by biting into a hard or sticky candy. Dr. John Walker and Dr. Liz Walker of Walker Orthodontics are here today to help you pick out some treats that will be safe for you to eat this Easter with your braces in Lunenburg, MA. If you know what to avoid and what’s safe to eat, then you can successfully protect your braces and reduce the risks of having to schedule a trip to the orthodontist. There are two words that Dr. John Walker and Dr. Liz Walker say that you should focus on when choosing foods to eat with braces: healthy and soft. With some ingenuity, it’s completely possible for you to indulge in your favorite treats without eating anything that can cause harm to your braces. Ice Cream- Full of calcium, ice cream is a great treat that can be enjoyed in a wide variety of Easter flavors and colors! Chocolate- As long as you’re sure that your candy doesn’t contain nuts, then chocolate is perfectly safe to enjoy. Cake- Whether it’s cheese, carrot, or chocolate, baked goods like cake or cupcakes make great snacks that can be decorated with an Easter theme! Marshmallows- Marshmallow chicks like Peeps are an Easter favorite, and are not too sticky for you to enjoy with your braces. Eggs- Easter egg decorating is a great family activity, and eating them afterwards provides you with a great source of protein! Gum- Gum is one of the worst offenders in damage to any orthodontic appliance. Besides sticking in brackets, gum can also remove elastics or break brackets off. Caramel- Although delicious, caramel is super-sticky in both its’ soft and hard forms. Avoid these at all costs. Nuts- Any chocolate with nuts or nuts by themselves can cause damage to your braces. Just one wrong bite can turn a great holiday into a nightmare! Sticky candies- Candy like jelly beans, gummy bears, or starbursts will stick to your teeth and provide a food source for plaque. Be sure to brush your teeth well to avoid any cavities. Hard candies- Any hard candy that you can bite into poses a significant threat to your orthodontic treatment. Like nuts, one wrong bite can turn into a major setback! In conclusion, be sure to stay away from any hard or sticky candy, and stick to treats that have somewhat of a healthy side to them. If you’re looking for an experienced orthodontist in Lunenburg, MA who can suggest healthy alternative treats for Easter, then look no further than Dr. John Walker and Dr. Liz Walker and their team at Walker Orthodontics! If you have any questions, concerns, or would like to schedule an appointment, feel free to call 978.345.7988. Happy Easter from everybody here at Walker Orthodontics!